Eighth grade scholars recently explored chemistry through the lens of aquaponics. 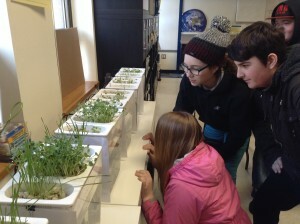 Thanks to Ms. Cavanaugh’s Donor’s Choose project, science classes received 12 “Back to the Roots” Water Gardens. 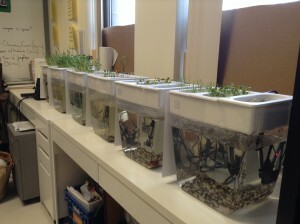 After setting up tanks and cycling water for a few weeks to figure out the ideal water chemistry, scholars added fish (a mix of snails, guppies, and bettas) to tanks and planted wheatgrass and radish seeds. Scholars learned how fish waste containing ammonia is transformed to nitrites and eventually nitrates thanks to beneficial bacteria. Then, nitrate rich water is pumped over the roots as a natural fertilizer. Scholars were shocked to see how this positive symbiotic relationship increased crop yield. Our first harvest came in less than two weeks! Of course, there are many pros and cons to aquaponics. Some scholars were worried about the bettas’ happiness in the tanks. They also contemplated the drawbacks to using electricity for the water pumps and heaters. This lead us to conduct two labs on electrolysis as we sought to explore how hydrogen gas could be generated and stored sustainably. Scholars wondered about using clean energy to power our tanks in the future.